If you are a complete beginner interested in learning to play the guitar, or looking to take up guitar lessons, then choosing your first guitar can be very confusing. The guitar has been around for a relatively short amount of time compared to other instruments, however it’s popularity and rapid growth means that you now have a wide range of options to choose from. Not knowing what the best option is for you, or even where to start could be the one thing that is holding you back from jumping in and learning to play. Read the article below to help you with choosing your first guitar. You may have noticed that there are many different types of guitars, each can have varying shapes, styles and colours. Although there are so many variations, guitars can be mostly broken down into two different categories: electric and acoustic. 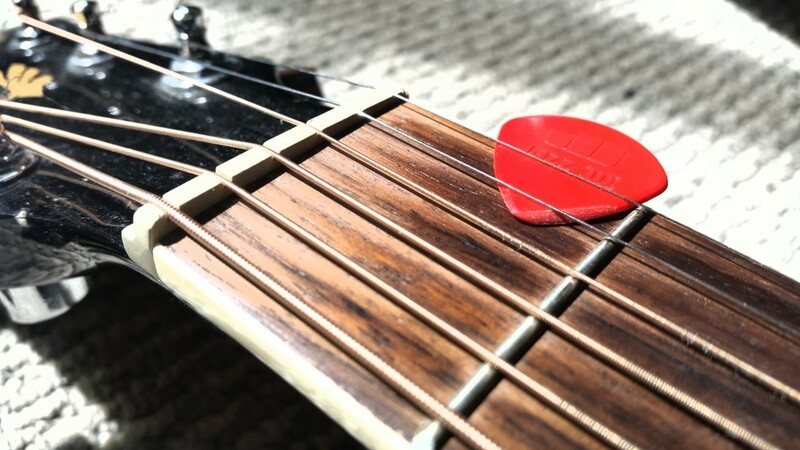 There are a lot of similarities between the two categories for example: they both have six strings (nickel and steel usually) and they both use frets to play notes. You can also do a lot of the same techniques with both of them such as strum chords and pick notes. 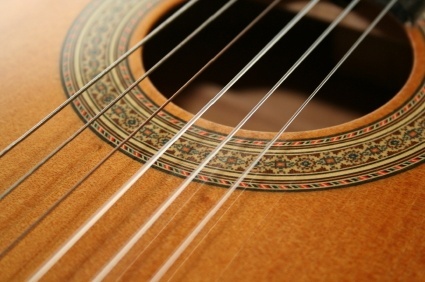 Acoustic guitars have larger hollowed out bodies with a round sound hole under the strings. This is to allow vibrations from the strings being played to be projected out of the sound hole, giving you a nice and bright acoustic sound. Acoustic guitars can take a little longer to learn because the strings are thicker and they require a little more hand strength which needs to be built up with practice in order to easily hold down chords comfortably. With the right instruction this will not be much of an issue, it will just take a little practice. Electric guitars have a much smaller body, most commonly without a sound hole. They require power and an amplifier in order to produce sound. Instead of a sound hole, electric guitars have two to three pickups which magnetically pick up the strings vibrations and turn them into electrical sound signals. If you have your electric guitar plugged into an amplifier that is switched on, you will hear the sound coming from the speaker within the amplifier. Electric guitars can produce a wide range of tones and effects. Distortion is a common effect (almost a requirement) in rock and metal songs, it is occasionally found in blues as well. You can also make the electric guitar produce a similar sound to an acoustic guitar which is what they were originally made to do. Large hollow body with round sound hole to project the sound. Easy to move around and a bit more portable than electric guitars. Can take a little longer to learn. 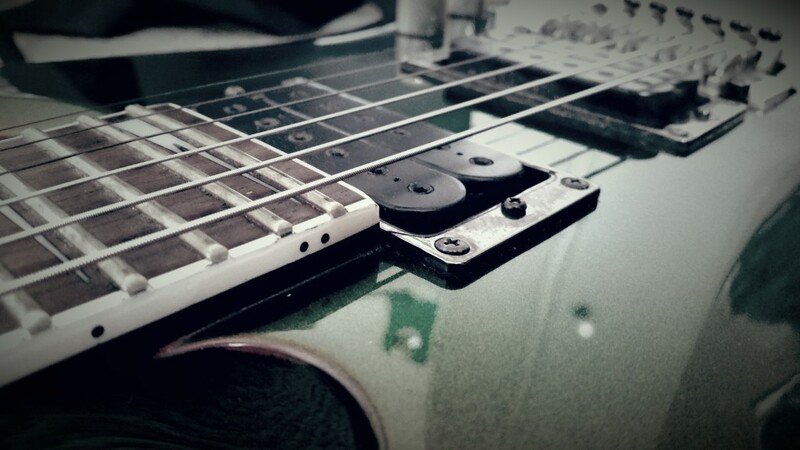 Uses pickups instead of a sound hole. Requires an amplifier to produce and hear the sound properly. Usually has more frets than an acoustic guitar. For Electric and Acoustic guitar lessons, Click on the related links in this sentence to find out more. Do you want a guitar that you can play anytime, anywhere? Acoustic guitars are a lot more portable than electric guitars. With an electric guitar, if you want anyone to hear what you are playing you will also need to bring your amplifier as well as have access to power. Acoustic guitars can be taken anywhere and are ready to go as soon as you pick them up. Electric guitars can be relatively portable as well depending on how big of an amplifier you have, just keep in mind that you will need access to power and an amplifier to be heard. What style are you interested in? What music do you want to learn? It is important to think about the types of styles and music that you like when choosing your first guitar, if you are into pop, blues, classical etc. Acoustic guitar would be better suited to those styles. If you are into rock and metal or bands such as AC-DC, or Iron Maiden then Electric guitar would probably be a better option. Choosing your first guitar has a lot to do with personal preference and it is a good idea to think about the type of music you want to play. If you are a parent reading this then think about the types of music that you would like to introduce to your kids. You may hear people say that you must learn acoustic before you can learn electric or the other way around. This is not necessarily true, a lot of people do start on acoustic and eventually move onto electric guitar as their personal preference changes, but there is no rule as to what is best to learn first. of guitar uses nylon strings which make it a lot easier to use than a steel string guitar. Nylon stringed acoustic guitars are widely known as being a “classical guitar” because that is the main style of music that they are used for. This does not mean that you must play classical music on a nylon string guitar. They are actually really popular in schools for young kids because they are a lot easier to play, and do not require a lot of hand strength to hold down chords. Anything that can be done on a steel string acoustic can be played on a nylon stringed guitar. Nylon stringed guitars are often slightly smaller and produce a quieter more delicate sound when compared to a steel stringed acoustic. Bigger and usually louder than nylon stringed guitars. More common for pop music. Easier to hold down strings and chords. Often associated with the classical style (but not limited to classical music). Up until the last few years, acoustic guitars, mostly nylon stringed guitars used to be a lot cheaper and more affordable than electric guitars. A lot of people who are on a budget would often pick out a nylon stringed acoustic guitar because it was the cheapest and electric guitars were simply too expensive. Now thanks to more affordable brands and companies, the prices are almost even between nylon, electric and acoustic guitars. This is great because it allows beginner guitarists to choose the type of guitar that they like rather than what is the cheapest. There is no real guide on the price you should spend when choosing your first guitar, providing that you buy it new. A lot of second hand instruments may be a lot cheaper, however they could require additional costs to get them set up correctly. As always if you decide to buy second hand, it is important to ask questions and do your research. Personally I would recommend buying new, especially if you are unsure what to look for. You will get a new instrument that is ready and set up to play, and you will know that there is nothing wrong with it. It is always recommended to change the strings on any guitar you buy as they could have been on that guitar for a few months or even years gathering corrosion. Cheap guitars are great, they are just as good as expensive guitars and work exactly the same. A beginner guitarist will most likely not know much about tone or other subtle differences that expensive guitars have. Often an expensive guitar is not worth buying until you have enough experience to make your own informed decision on what you want to buy. A lot of teachers try to discourage students from buying an expensive guitar, mostly to prevent the student from becoming stuck with the guitar should they decide either guitar just isn’t really what they want to do or they may want to move from electric to acoustic. This is true for a lot of people and it is important to think carefully about what you want to achieve with learning the guitar. However some students can get the best out of their lessons by purchasing a guitar that they really like or they may have seen their favourite guitarist playing one that they want. This can be a great way to keep the student focused on what their original goal was with taking on guitar lessons. I would recommend to go to a music store and pick out a few guitars that you might like the look of, then sit down with one even if you can’t play yet and pick the one that feels most comfortable for you – almost like picking out a chair or a couch! Each guitar has slightly different weights and sizes, think about the colours and shapes you want or like the look of. If you are happy with all of these things it is a good sign that you will enjoy learning with it a lot more. Highly recommended to buy new as second-hand guitars often require additional costs to repair or set them up correctly. There is nothing wrong with picking the cheapest guitar in the shop, they all do the same job. If you decide on an expensive guitar think carefully about your goals with the guitar. Prices are relatively similar between acoustic, nylon and electric guitars. Pick what you want to learn. If your budget allows, pick one that feels the best to hold and sit with, also what you like the look of. Ask for help. People in music stores aren’t there to judge you at how well you play (if at all) they do have a lot of knowledge. Use them. A lot of people may not have even noticed, but unlike a pencil, there is actually a difference between left and right handed guitars. A right handed guitar is designed for you to use your right hand to do the strumming, and your left hand holds the chords. Left handed guitars are designed the opposite way with your left hand strumming, and your right hand holding chords. If you are right handed, you will most likely feel most comfortable with a right handed guitar. If you are left handed, you do have a bit of a choice to make when choosing your first guitar. Most guitars are designed for right handed people, as you may know most people are right handed. A music store may stock 90% right handed guitars and only 10% left handed guitars. This means it can be a little harder to find what you want, but not impossible. Another point to consider is that if you are planning on playing with other guitarists you will most likely only be able to use your own instrument as it is pretty likely that they will be right handed. The best thing to do first is go to a music store and ask for two of the same guitars only one right handed and the other left handed. Even if you have never held a guitar before, you will get a pretty good idea as to which feels most comfortable. It is very important to find out which feels the most comfortable when choosing your first guitar over any other factor. Everyone is different and you really do need to sit down with a couple of guitars to feel what is best for you. If you can’t make up your mind, I would recommend going away and coming back the next day or another time to get a fresh start and it may help make the differences seem more obvious. Right handed people tend to use right handed guitars. 80-90% of guitars are right handed. If you are left handed, sit down in a music store and compare what fells best to hold. Go with what feels right. If you are unsure, ask someone in a music store, they get questions like that all the time and will be happy to help. Hopefully by now you should have a better understanding of the different types of guitars and are more comfortable choosing your first guitar. As you read through the article it now should be clear that you should try to go for one that is comfortable, appealing to you. Most likely if you bought it new then it will sound great too. If you are still unsure about what to pick when choosing your first guitar feel free to contact me and ask any questions regarding guitars. contact me to discuss your goals and I will be happy to help you.